Marco On The Bass: Madness 'Do Not Adjust Your Nut' Tour Update: Band Debut Five New Songs - Download Them Here! 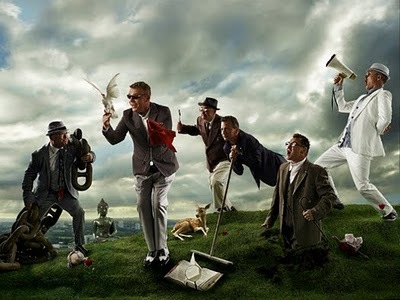 Madness 'Do Not Adjust Your Nut' Tour Update: Band Debut Five New Songs - Download Them Here! The Madness 'Do Not Adjust Your Nut' tour continues rolling across the U.K. despite heavy snow. According to fine folks at Madness-Central (your one stop shop for all things Madness) the band have unveiled more new songs including: 'Hey Girl', 'Blue and Black', 'Kitchen Floor', 'La Luna' and 'Big Time Sister' and I have them for you to download and enjoy! But first enjoy this video from guitarist Chris Foreman's 'ax cam' during the band's performance of 'The Young and The Old' in Manchester last night.